There are two large "Canyon" workclass rovs working here and one small eyeball a sea eye "Tiger". One of the workclass has suspended under it the tool for pulling in and connecting the flow line centre picture. The structure behind the rov,s is a template containing several wellheads. 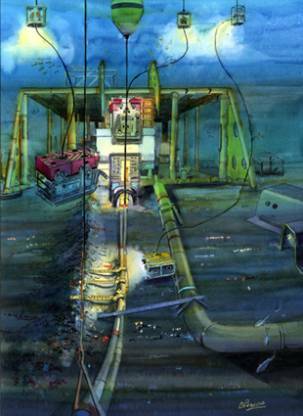 The "Tiger" in the foreground is checking three twist restrictors, which are holding the two flowlines from turning over themselves as they are pulled into the wellhead. There is a lift bag taking some of the weight, and the fibre glass covers, the the right, have been removed prior to work commencing.